Rebel came to us from Finland as our first show dog and we are very excited about what he is going to do in the ring and on the field. Rebel has one of the sweetest dispositions I have ever seen in a PH. He is the easiest pup we have raised and is extremely mellow. We have affectionately nicknamed him "the tank" as he runs through anyone and anything standing in his way. Rebel, though very stubborn, is a complete love. He cuddles on the bed every morning by throwing his body on top of us and then promptly falls asleep! Like Anubis, Rebel is an instigator! He finds ways to encourage his "brothers" to play with him. Whether that is by barking or ambushing them as they walk past, it doesn't matter to him as long as they play! His favorite past times are following his nephew, Emerson, around the yard, barking at squirrels and playing chase! In addition to conformation, Rebel is also shaping up to be a very nice lure courser. 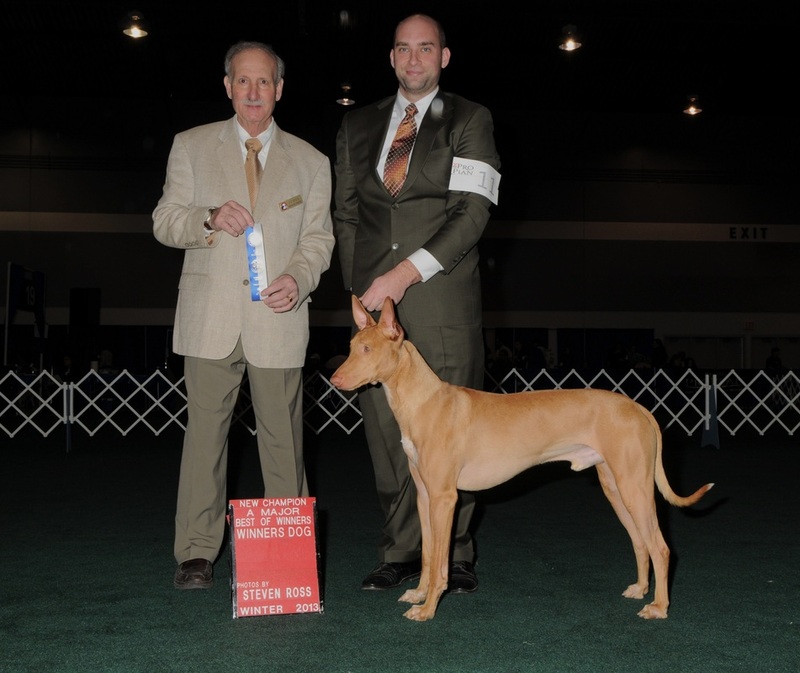 At 14 months old, at his first trial, Rebel earned 1st place in the Open stakes! But what has become the most memorable event at that trial was Rebel laying down at the starting line right before the huntsmaster called "Tally-Ho!" He is so mellow and easy-going that he couldn't figure out why all the other dogs were howling and in such a frenzy when the "bunny" wasn't even moving!! Rebel has a tremendous amount of speed and best of all is incredibly easy to retrieve at the end of his runs. 07/10/2011 Timberland Valley Dog Fanciers Assoc. Inc.
10/08/2011 Fraser Valley Dog Fanciers Assoc. 10/09/2011 Fraser Valley Dog Fanciers Assoc. 10/10/2011 Fraser Valley Dog Fanciers Assoc. 02/19/2012 Mount Cheam Canine Assoc. 03/24/2012 Western Washington Whippet Assoc. WD, BOW, 3 pts (major) New AKC Champion!!!!!!!!!! WD, BOW, 2 pts (major) New CKC Champion!!!!!! 1st Place, BOB, 5 pts (major) New Field Champion!!!!! 2nd Place, BOS, 1 pt New Gazehound Racing Champion!!!! !